"Higley has been so identified with the L.S.C. that it is impossible to think of one without thinking automatically of the other." Halliday was one of the earliest members of The Little Ship Club, alongside Claud Worth the first President and, from the outset, was a hugely committed and active member. He was appointed Honorary Seamanship Instructor in 1928 – a position he was to hold for twenty-two years - providing regular classes to members, which became increasingly popular as the club rapidly expanded. A photograph of Halliday leading a ropework class was published in the Daily Express on 24 November 1932, under the heading “Seamanship in the City”. He was also a regular contributor to the club journal, on one occasion designing a wrinkle for fixing the main boom in a crutch (L.S.C. Journal, No 4, Vol 2, 1928). “There must be few people who are better known in yachting circles than Higley Halliday, who is the extremely popular honorary seamanship instructor to the Little Ship Club. His cheery personality and his aptitude for dealing thoroughly and in an easily understood manner with any branch of the subject, make him a very interesting speaker, and he also lectures a good deal in the provinces. Each winter season when his fortnightly classes take place at Beaver Hall, more and more people attend. When I was present at one last year there was, I believe, an audience of about 80. Last week Halliday told me that there have been over 120 at each of the three lectures held this winter. Halliday actively participated in the running of the club, being Vice Chairman of the club committee in 1931, 1932 and 1933 and remained a committee member until 1938. 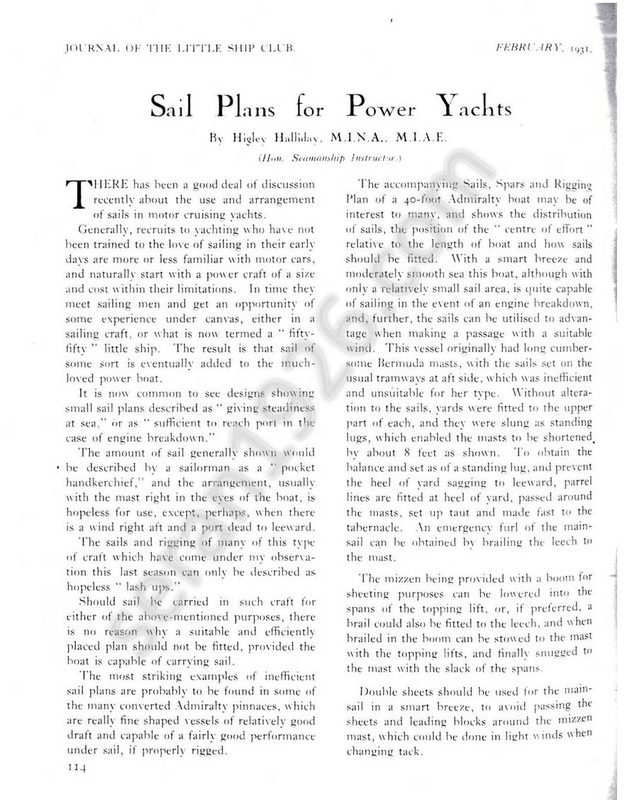 He was supportive of a club event for motor boats held at the same time as the North Sea Race during the August bank holiday, based on the motor boat sub-committee working up a rating rule such that sailing and power craft should be timed to finish at about the same time (1934). He also acted as official measurer on the L.S.C.’s annual Colne-Ostend cruise (1935). Halliday was included alongside other prominent members of the club including Commander John Irving and Jack Maltby in the 1 January 1936 Tatler Sketch, displayed in the clubhouse. In 1938 he served as Vice-President. “I think most of the trouble may be caused by enthusiastic people who take to sea yachts and motor boats which are not really suitable. Good boats get into very little trouble, but there are people who see a sailing or motor boat and like the look of it, and buy it. They have no practical knowledge, they have no one to advise them. They often get a bad boat – one not fitted to go to sea at all events. The sails may be rotten, and the wind will blow them to bits. The enthusiast has not thought of having any spare sails, and so the lifeboat has to put out to his aid. It may be an old boat with bad gear, and even a good sailor in a rotten boat cannot get very far. Throughout the 1930’s and 1940’s Halliday undertook a range of work for L.S.C. members. In 1934 he designed the 37 ft., 15 ton auxiliary schooner 'Mary Fortune' built by A. M. Dickie & Sons, Tarbert for club member P. Dalzel Job. Halliday more typically undertook smaller consultancy projects for club members and, as one might expect, this consisted of sail plans for a range of craft, primarily sailing dinghy's and auxiliary yachts, such as ‘Bill Adams’ (J. Williams, 1930), ‘Spinaway’ (Sydney E. Figg) and ‘Peggy H’ (A. K. Black, 1948), together with miscellaneous projects such as his drawings of fittings for a new 10 ton auxiliary yacht (J. R. Smellie, 1931). Following the outbreak of the Second World War, the L.S.C. 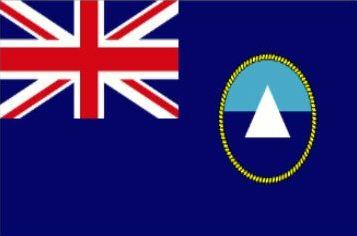 played an important role in providing shore based training to amateur yachtsmen who formed the Royal Naval Volunteer Supplementary Reserve (subsequently the London Flotilla) and it's for this service the club was given the Warrant to wear the Blue Defaced Ensign. Halliday played a central role in providing this training, whilst continuing his regular lectures including “Laying up for the Duration or Extended Periods” (1940) and “Little Ships Past & Present” (1942). In recognition of his contribution to shore based training he was appointed Lieutenant and a “Four Striper” in the R.N.V.R. Sea Cadet Corps and club members presented him with a memento by way of thanks for his services to the club. Halliday owned a large collection of sea shanty songs and music and, in addition to his role as Honorary Seamanship Instructor, he was also the 'official' shanty man at the L.S.C. Halliday retired from active involvement in the club in late 1950 and members acknowledged his huge contribution by electing him Honorary Life Vice President, a position created especially for him. "Time makes many changes inevitable, among them some which nobody wants, and the coming winter season will see a change which can only be described as the end of what had become an institution. Higley Halliday, compelled by ill-health which would have driven a lesser man to resignation a couple of years ago, will no longer be the Club’s Honorary Seamanship Instructor. I do not know who will regret this more ; Higley himself, or those who have been privileged to be his students. As his fellow instructor and one time student, seeking to follow where he has led, and knowing something of what his services have meant to the Club over more than two decades, I am glad to have the opportunity of expressing, however inadequately, something of the gratitude we all owe him. 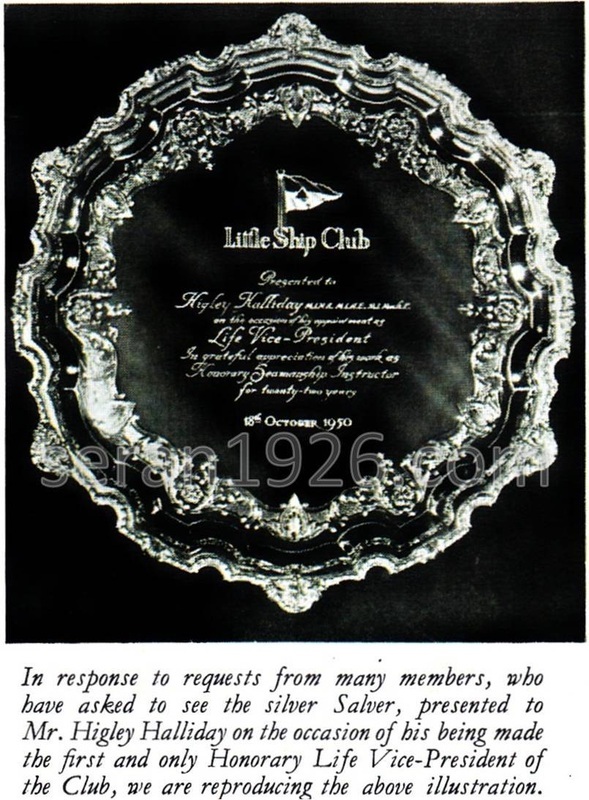 The Little Ship Club held its first meeting in November, 1926 and early in 1927 had a stroke of great good fortune. A certain Mr. Higley Halliday – soon to become Higley, simpliciter, to all who knew him – applied for membership. Though not technically a foundation member, he was one in reality and spirit, and from the first days of his membership became one of the most ardent and capable workers the Club has ever had, pre-eminent among those who have built it to the great organisation it now is. In 1929, two years after joining, he became Honorary Seamanship Instructor, a post he has held continuously until now, doing the intensely hard work of that Office single-handed with that supreme competence and joy that is only to be found in those who labour for the love of it and have a genius for what they do. That genius has reflected itself in the success of the seamanship class, which, hardly more than a handful when Higley took over, has grown from year to year, becoming too big for the Strathcona Room and requiring the Great Hall for numbers, which of recent years, have well exceeded the hundred mark. For most men this would have been enough and more than enough, but not Higley. In 1930 he undertook in addition the duties of a Member of Committee – not heavy, perhaps, in comparison with his seamanship instruction, but no sinecure, as done by Higley – and remained uninterruptedly on the Committee until 1938. For three years – 1931, 1932 and 1933 – he was Vice-Chairman of Committee and in 1938 he was Vice-President. For very many years – I do not know exactly how many, but for longer than I have been a member of the Club – he has been our honorary technical adviser in all matters connected with little ships and has put his vast knowledge and experience in this field freely at the disposal of all those members, and their number has been very large, who have been in need of it. He has a post bag like a Member of Parliament and attends to it much more conscientiously than many of them do. He has conducted the Seamanship Examination since its inception and is the donor of the prize which bears his name. Until last year, when ill-health stopped him at the last moment, he has always taken charge of our North Sea Race, and when last year, I substituted for him at Brightlingsea, I learnt, from the many enquiries and good wishes for him from members of other clubs, what a first-class ambassador and standard bearer of the L.S.C. he has been. Despite the scope of his activities in the Club it is undoubtedly his work as Honorary Seamanship Instructor which has always come first. Seamanship is a most difficult subject for the classroom – until I heard Higley tackle it I thought it almost an impossible one. I wonder how many of the hundreds who have attended the lectures realise quite how much work they involved outside the lecture hall. I was privileged to see his course notes a couple of years ago when, owing to a sudden illness, he asked me to mark the answers to the examination papers he had set. I am guessing, but I do not think I am far wrong, when I estimate that every hour of Higley instructing with such cheerful and apparent ease in the classroom has its background of at least another hour sweating in preparation in his study – to say nothing of the making of those perfect models, which have been such a feature of his classes and their erection and dismantling evening after evening. For as long as I have known him, Higley has been so identified with the L.S.C. that it is impossible to think of one without thinking automatically of the other, and it is good to know that we shall still have the benefit of his advice and guidance, and the pleasure of his cheerful company and good friendship as our Vice-President, our first and only Life Vice-President. In offering Higley the unique and signal honour of creating this Office for him, the Committee have judged well the feeling of the Club towards him for his unique and signal services over a very long period of time. Well done and thank you, Mr Vice-President, in the name of us all." On 15 February 1962 Halliday attended the reception held by the club to commemorate the laying of the foundation stone by the Lord Mayor for the new clubhouse at Bellwharf Lane near Southwark Bridge, ushering in the club's modern era.